You wake up early in the morning, what would you think of doing? Well, for me, I would consider to brush my teeth and get a cup of warm coffee or tea. 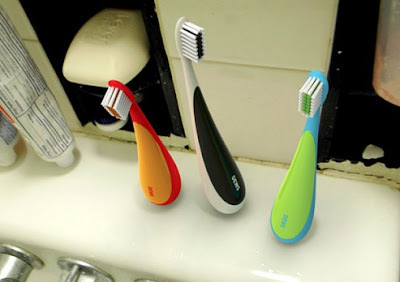 Speaking of brushing teeth, the first thing come into your mind is a good toothbrush and possibly the one with unique design that would make you love to hold on those toothbrush every morning. Two South Korean designers at Ryan Hac, Hyun Jin Yoon & Eun Hak Lee have come up with a Standup Toothbrush concept, that will protect the hygiene of your toothbrush of getting dirty on those nasty bathrooms. Dews toothbrush will always stand upright when placed on a flat surface, using the same concept as a thumb doll. Dews Toothbrush also won the Red Dot Concept Award in 2009.